Florida has a hot and humid environment with some plants not being able to take the heat. Winters are mild as well in the state. Flowering shrubs for Florida include those that are hardy in USDA Plant Hardiness zones 8 through 11. These shrubs can provide rich foliage and colorful blooms to enrich any landscape. The orchid tree, also known as Bauhinia variegata from the bean family, is a fragrant evergreen that is a fast-growing shrub. It gets 20 to 40 feet high and 10 to 20 feet wide. Leaves are deciduous and 4 to 6 inches long. Flowers are 3 to 5 inches wide in clusters and purple-blue, magenta or lavender. Plant an orchid tree in acidic soil in full sun. Propagate via seed, cuttings, or occasional suckers in USDA hardiness zones of 9 through 11 (north Florida may have difficulty). The scarlet hibiscus or scarlet rose mallow, also known as Hibiscus coccineus from the mallow family, is a wetland perennial shrub. It gets up to 7 feet high with red 6- to 8-inc- wide flowers and narrow leaves. Plant a scarlet hibiscus in moist soil in full sun. Propagate via seed or division in USDA hardiness zones of 7 through 11. The peacock flower or Barbados pride, also known as Caesalpinia pulcherrima from the bean family, is a drought-tolerant perennial shrub that attracts butterflies. It averages 8 to 12 feet tall but can get up to 15 to 20 feet high. Leaves are fern-like and flowers are orange and red, 2 to 3 inches wide, and shaped like a bowl. Plant a peacock flower in well drained soil in full sun to partial shade. Propagate via seed in USDA hardiness zones of 8 through 11. The night blooming jasmine or night jessamine, also known as Cestrum nocturnum from the nightshade family, is a fragrant evergreen vine-like shrub that is easy to grow. Leaves are 4 to 8 inches long and smooth. Flowers are tubular and green-white with white berries to follow. The plant gets 12 feet high and 4 feet wide. 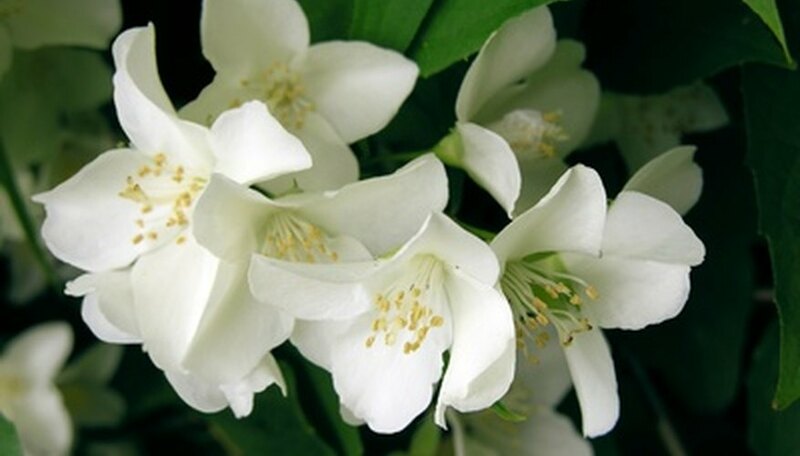 Plant a night blooming jasmine in light moist soil in full to filtered sunlight. Propagate via seed or cuttings in USDA hardiness zones of 8 through 11. The rose glory bower or Kashmir bouquet, also known as Clerodendrum bungei from the verbena family, is a fragrant shrub that attracts butterflies. It gets 6 feet tall with 1-foot-long oval leaves and clusters of flowers 8 inches wide. Blooms are rose colored. Plant a rose glory bower in full sun or partial shade in any soil. Propagate via cuttings, suckers, or root sections in USDA hardiness zones of 7 through 11. The Arabian jasmine, also known as the Jasminum sambac from the olive family, is a fragrant evergreen vine-like shrub. Leaves are in whorls and opposite pairs with white flowers 1 inch wide in clusters. Black berries are the fruits. Plant an Arabian jasmine in full sun or partial shade in moist soil. Propagate via cuttings in USDA hardiness zones of 9 through 11 (north Florida may have trouble).